Happy last week of summer break! Remember those days growing up? One more week to fit in every last bit of fun because life is basically over once school starts. Well, lucky for me, I don’t have to go to school or do homework anymore, so I’m not enjoying this last week of freedom because of those reasons… I’m enjoying it because we’re currently kid-free. Is it bad that I’m kind of loving it? One more week to fit in every last bit of quiet, tantrum-free time because life is basically over once school starts. Okay, slight exaggeration… but it IS going to become much less relaxing. Everyone is working this week to get things ready for the start of school/the after-school program/the overnight program. I have been assigned the task of organizing the library which, if you know me, you know that I love books. I’m more than happy to take on the challenge. Vanessa started the process of cataloging and sorting the books, and I’m finishing the work she started. I spent all of yesterday and half of today holed up in the library, listening to music, putting stickers onto books, and entering information about each one into a spreadsheet. The alone time has been great, and I always like tasks like this. It’s simple and a bit repetitive, and I get to figure out the most efficient way of getting it done. There’s nothing better than making a plan, executing it, and knowing that it was done the most effective way. Ah I love efficiency. I made great progress yesterday, and I think I would have finished today if I had worked on it during the morning as well. Instead, Debbie and I had the joy of cleaning the floor in our old classroom. Throughout the course of summer school, it got to be more and more of a disaster. 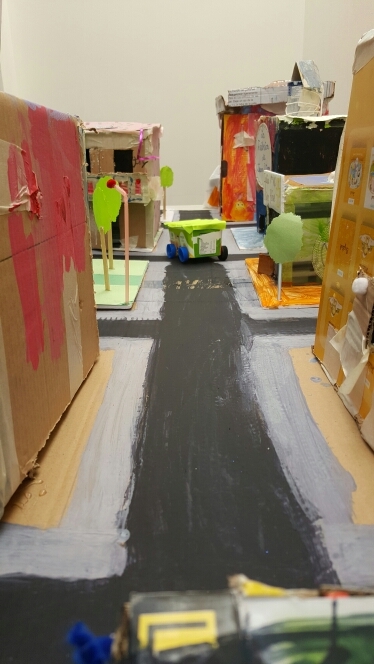 A lot of the kids worked on their models on the floor which means that it was completely covered in glue, tape, glitter, and paint. After sweeping up whatever we could, we went at the paint spots with soapy water and scrubby brushes and the glue and tape with razor blades. Thankfully, Debbie brought some mats that had been adapted into knee pads, so we didn’t have to kneel on the floor or squat the entire time. It made things about a million times more comfortable. Over an hour later, we had a floor covered in only soap, and I felt gross. We mopped to get the soap up and then left the floor to dry. Not my favorite thing I’ve ever done, but at least I felt accomplished at the end. Plus, now it’s finished, and we won’t have to do it again! Tomorrow I’m headed back to my library cave to finish up the rest of the books. Is it lame that I’m a little bit excited? If only there were more books… It’s too bad that I’ve been so efficient because I only need another couple hours to finish. I’d be happy doing that job all day. Yesterday was another long and tiring day! I started writing this last night, but I was doing the whole fall-sleep-and-write-nonsense thing, so I figured that finishing it would be better left to today. Wednesdays are usually kind of chill because we don’t have any classes, but yesterday was definitely the exception. The big activity for the day was finishing up the soldering and antennae on the C3 robots to get them ready for class today. I got started in the morning and had only finished the soldering and antennae bending by lunchtime. The afternoon was completely booked by a birthday party for the people with January/February birthdays. 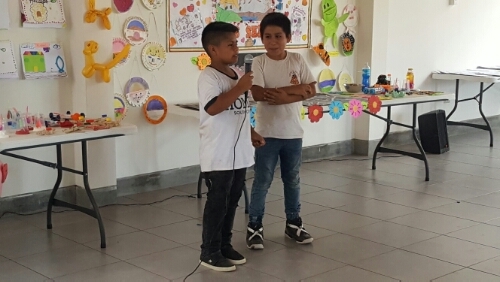 The kids get to drink soda and eat candy, and there were some pretty hilarious activities. 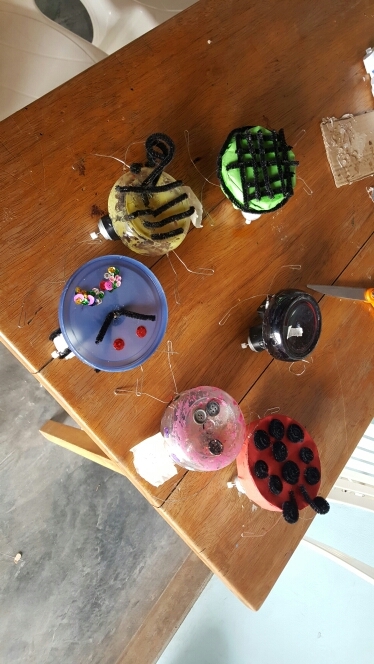 They started off with some races where each person on the team had a straw in his/her mouth, and two teams raced to pass a plastic ring from straw to straw without using their hands. After that, they did a relay race where the team members had pass a balloon over their heads and through their legs, and then afterwards, the front person waddled their way around a chair while holding the balloon in between their legs. The process repeated until the entire team got a chance to waddle. It was fun watching the kids play the games, but my favorite part (besides the cake, of course) was the dance party at the end. Ligia explained the rules: you dance around with the music while it’s playing, and once it stops, you freeze like a statue. The real fun began when the kids started to be creative with their frozen poses, the girls usually opting to hug each other and the boys pretending to fight. After the party, we had a little down time to work on our robots, until about 5:30 when we left for a staff bonding excursion! I wasn’t sure about going because we still had a lot to do with the robots, but I’m so glad I did! It was cool getting to spend time with everyone outside of work, plus the excursion was great. 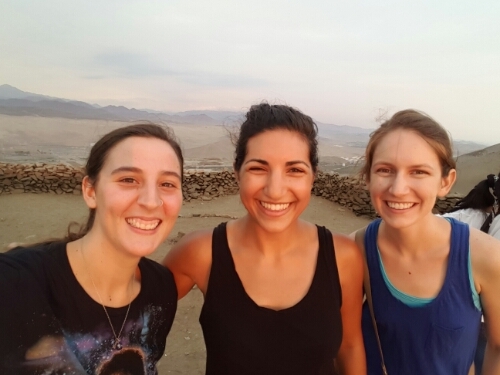 We went to Las Salinas in Chilca to do a group hike. 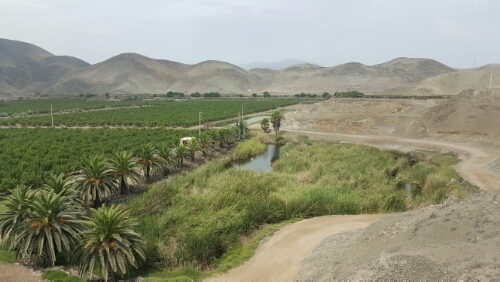 The first part of the hike is pretty short, and you make it to the top of the first hill where there’s a huge cross and a nice view of Chilca. There are two ways to get there: the way you’re probably supposed to go, with a bunch of switchbacks, and the way we went, with an aggressive incline (I’d guess 60 degrees) and shale-type rock pieces sliding around. I thought the view from there was cool, but then we kept going! We went up more super-steep hills until finally reaching the top… where there was a random rock wall. 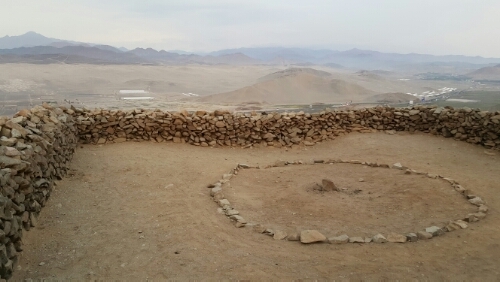 I was confused about why it was there until we got closer and I realized that it wasn’t just one wall, it was a square of rock walls, and inside was a rock circle with one rock in the middle. Weird. The explanation of what it is makes it no less weird: aliens. The front of the Chilca pamphlet. Alien. Chilca is obsessed with aliens. The tagline of the city is “Chilca es de otro mundo” or “Chilca is from another world”. There are a bunch of reports of UFO sightings, and the Chilca marketing people have run with the idea, making it the center of their marketing material. 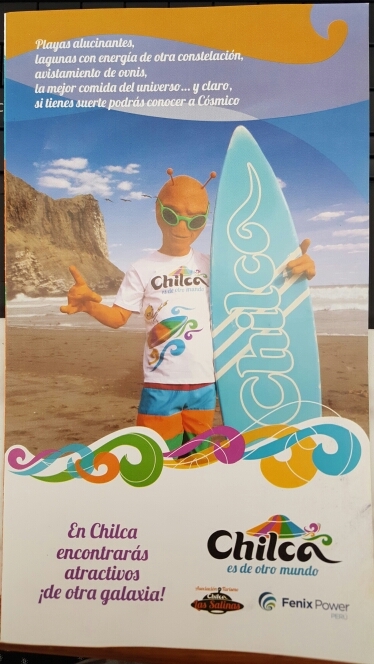 The pamphlets describing the attractions in Chilca feature pictures of a red-orange alien participating in activities from horseback riding to bathing in the lagoons that supposedly wield “energy from another galaxy” and have various healing powers (here’s the website). Vanessa said that people come from all over the world (alien-enthusiast types of people) to do rituals or something to communicate with the aliens from inside the rock shrine. There’s some claim (by a Peruvian “UFO contactee” Sixto Paz Wells… if you’re interested, here’s a weird interview with him) that they’re drawn here because Chilca is on a geological fault and the released energy creates a magnetic corridor that their ships use. Or something. I’ll let you form your own opinions about that. Whatever the reason for their existence, they’re impressive. The walls are made from rocks just stacked on each other without cement to hold them together, and they aren’t cut into specific shapes or anything to make things easier. Whoever put that place together had a lot of time on their hands. Anyway, the view from the alien communication square was even better than the first lookout. I’ll just let the pictures speak for themselves. Check out the mountains in the background! Debbie and I still had hours of robot work to do after getting back which is why I was falling asleep last night while writing. We finished the antenna connections around 10:45PM… ugh. But now they’re finished! And the hiking break was well worth the time. Today wasn’t extremely eventful. 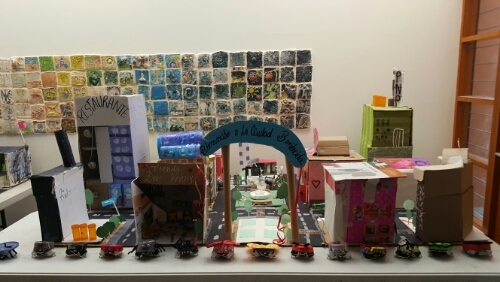 We had our last period with Vanessa’s class and tried to wrap up their city and robots. It mostly went fine except that one robot started smoking when we put batteries in… ehh well, we’ll figure it out. That’s a problem for tomorrow! If I never have to solder another connection, it will be too soon. The fact that I’m going to have to do it again on Monday means that it’s DEFINITELY happening too soon. I’m going to have robot-filled nightmares tonight. Measuring a wire before cutting and stripping it. Next week is the last week of summer school, so we really have to get this robot project wrapped up so that we can finish the city project too. Even though the robots aren’t finished yet, I’m happy with the progress we’ve made, and I don’t think we could have possibly worked any faster than we did. There’s just too much to explain, and every single step has to be almost fully supervised because they’re using tools and are way too likely to jump ahead and mess something up if you don’t keep an eye on them. 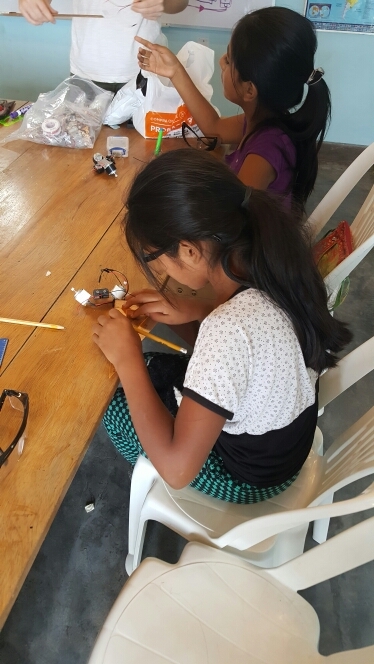 Today, all of the groups were finally at the point where they were ready to start soldering, and there was nothing we could do to put it off any longer. 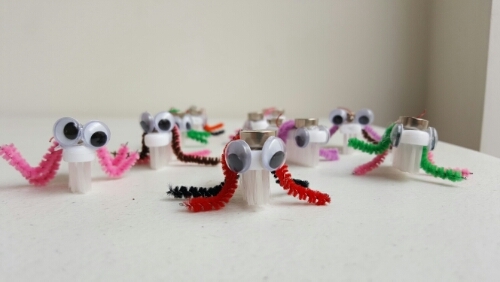 I would love for the kids to have a chance to try to solder, but I don’t know that we’re going to have the time for that. With all of the explanations and safety stuff we have to do, there’s no way that we would be able to get through all of the kids. Maybe we’ll try to at least let each of them do one connection so that they have the experience… And maybe not… We’ll have to just play it by ear and decide if we think they can handle it. Vanessa helping with wire cutting. We had class with the older kids in the morning, and it was a bit chaotic. I always expect the younger class to be somewhat out of control, but not this class. Someone must have been giving out pixie sticks at the door when they got to school today or something because they were all over the place. 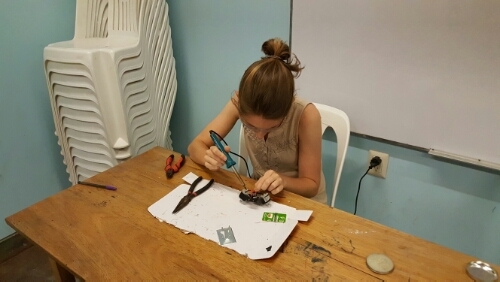 Debbie gave them the whole talk about how soldering is dangerous and the iron is very hot and they need to listen and be careful, and then as soon as we started working, the whole class was crowded around the table and touching things and stressing both of us out. She basically told them that if they couldn’t behave, they weren’t going to get to work on their robots anymore. That did the trick, at least enough to make it through the end of class without anyone getting a burn. 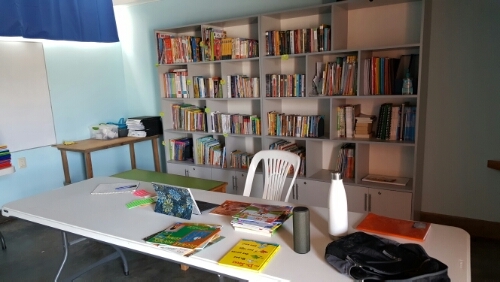 The younger kids were in the afternoon, and working with them was like something out of a dream (for the most part, excluding the one girl who was pouting instead of participating because “this is a boy project”. I won’t even tell you how I felt about that comment. I’m sure you can imagine). They were all so calpm, they listened and followed directions, and they did a great job. Vanessa must be working some magic on them because their behavior today vs. the first week of summer school is like having a completely different group of kids. I still think that part of it is the excitement of the robots (kids keep asking when they’re going to get to work on their robots again), but part of it is absolutely also them being much improved in general. Debbie, finishing up the last robot of the night. The kids got all of their wires cut and stripped, and we started soldering them during class. We got through most everyone in the afternoon group (which is only half of the class, keep in mind), and after all of the kids left, Debbie and I decided to keep on going to finish up the connections so that next week can just be putting the finishing touches on. That was the most exhausting part of the day. All I wanted to do was snack and eat dinner, and we didn’t end up eating until 8PM. I’m falling asleep while typing again, so I’ll do you a favor and wrap things up before my writing really starts to tank. Hooray for Friday, and hooray for weekend days when you can actually sleep in! The more I think about it, the more I realize how much the team week threw me off. I’m currently feeling a little stressed and overwhelmed, and I was trying to understand what is different about this week that has me feeling that way more than usual. I think that it’s partly because I didn’t accomplish much of anything last week since we were so busy, and now I have an extra week’s worth of things on my to do list. The other part of it is that I’m in the planning stages of a few different things (including my trip to Machu Picchu before I leave Peru, some stuff for my time in Armenia, and some randoms), and that always gives me a feeling of unrest until the planning is finished or at least underway. No need to worry about me though… I’ve done a re-write of my to do list, and that’s making me feel a bit better. Now I need to get to crossing some things off! Robot construction in progress! Debbie has been making the kids wear safety goggles even when they’re not doing anything that even remotely requires them. It makes them look like they know what they’re doing though, doesn’t it? Otherwise, things are going well! We had our second robot class with the oldest kids this morning, and the excitement of making robots hasn’t worn off yet (thank goodness!). The half of the class we worked with today hadn’t even started their robots yet. We got them through the entire assembly process, and they had time to get started on cutting and stripping the wires to prepare them for soldering. They all did a great job with that, and I was excited because I want the kids to do as much for themselves as possible. The older class is definitely capable of doing most of the work with just a little guidance. Soldering will happen next class, and hopefully we can figure out a way to get them involved in that as well without having any safety issues. I think they can handle it, especially if they keep behaving as well as they have been. They’re taking this project really seriously. 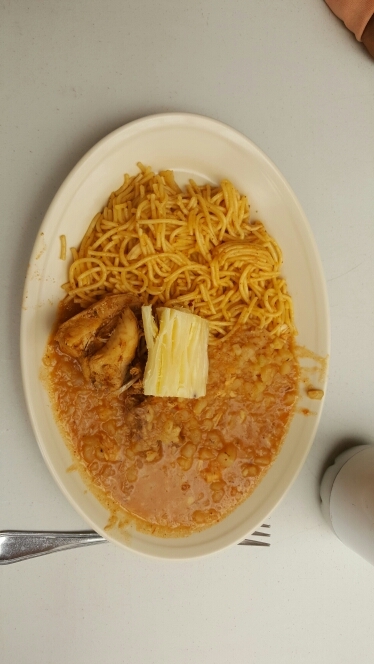 Spaghetti, chicken, yuca, and carapulcra. Lunch today was spaghetti, yuca (which is apparently the same as or similar to cassava… which I spent all of my time in Ghana not knowing what it was – even though we had it at the farm and I planted some – and too lazy to look it up), chicken, and carapulcra. Carapulcra is a Peruvian stew that probably varies dramatically depending on who makes it and where you are. From what I could gather while eating it, Delia’s carapulcra consists of potatoes, sauce that I couldn’t identify even if I tried, pieces of chicken (watch out for stray bones), garlic, and I have no clue what else. I know, that description couldn’t possibly be more unhelpful. All I can say is, I’m no food connoisseur, so that’s the best I can do. In summary, it was pretty good, even though I was sure I was going to choke on a hidden chicken bone. Julie’s class loading their boats with bears. Tuesdays are little kid engineering afternoons, so Julie and I teamed up to make aluminum foil boats with the two youngest classes. It’s questionable how much the kids actually did in her class (the 2-4 year olds) vs. how much we did for them, but it kept them interested for close to an hour, so that’s all that really matters in my book. 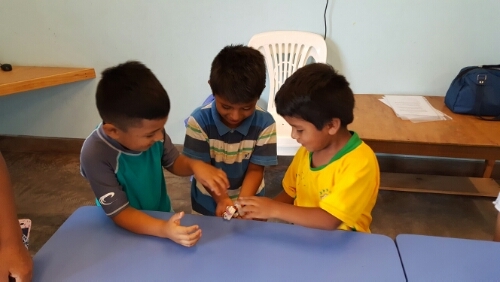 Each kid got a piece of foil and as much tape as they needed, and after they finished, they put their boats into a tub of water and loaded them with these little plastic bears we found in the supply closet. Julie even fit in some teaching about how the bigger boats with higher walls held more bears and got the kids to compare the numbers of bears that each boat held to see which boat worked the best. 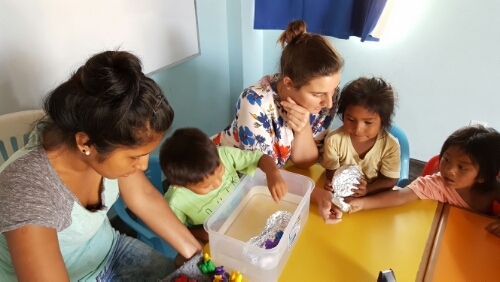 In the slightly older class (4-6 year olds), there was a bit more chaos, but the kids actually built their own boats (some with a little help from us). They had way too much fun splashing around in the water, but somehow we survived and the kids possibly enjoyed it and learned something? We’ll just say they did. None of you were there, so I can make things up like that. Let the records show that class today went perfectly according to plan and the kids were totally under control and engaged and they built fabulous aluminum foil boats and now they all want to be engineers. Wow! We did a great job, huh? 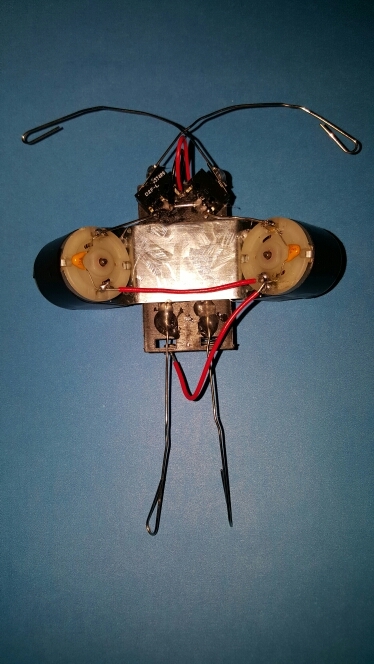 ​We started the robot project today! It went so much better than I was hoping for, and thank goodness for that because my expectations were incredibly low. We had the oldest kids (C4) in the morning, and it was nice to have a chance to figure out the best process and work through some of the kinks while having a more controlled and engaged class. I didn’t take very many pictures because I was mostly running around and trying to help different kids with the assembly, but here’s one of the two that I managed to snap. We decided that the best approach was to split the class in half and have one group working with us on the robots while the other group watched a robot-related movie (today’s pick: Wall-E). Things went extremely slowly in the morning, and we didn’t get nearly as far as I thought we would (shocking, I know. One of the hardest parts of teaching is managing your own expectations of what you’ll be able to complete in a day). We wanted to get all of the assembly finished for all of the kids in the class, but we only managed to do it for half of them. We’re going to need to alter our plans a little if we want to have a chance of finishing these things on time. Good thing we have those flex periods next week! The process went a bit more smoothly with the younger kids (C3, Vanessa’s class of 7-9 year olds), and we were shocked by how well-behaved the kids were. Her class especially is at that age where they’re usually running all over the place and kind of out of control, but today they were waiting patiently for instructions and did an incredible job of listening! How cool does this look? There’s something about electronics and wires that makes anything look impressive. As soon as you have some wires in front of you, it looks like you mean business. I think that a big part of the reason for the good behavior is that all of the kids are super excited about this project. When we showed them the demo of our robot, they all got wide-eyed and were clearly pumped about the fact that they were going to make the same thing. Even the kids who act like they’re too cool for school were getting excited. Hopefully this good behavior lasts the entire time that it takes to make the robots because this isn’t exactly a quick process, and having a bunch of kids running around and screaming would make it about a million times more painful. All in all, I’m very happy about how things went, and I can’t wait to see how the robots turn out! In other news, I’m falling asleep at the computer again, so please excuse me if anything I wrote makes zero sense because it probably happened when I was asleep. I think I caught all of them, but my brain isn’t functioning quite well enough to go back through and process everything. I need to see if I can find time to hibernate this weekend. No More Vinifan (For Now)!!! ​You’ll never guess what happened today… we finished wrapping all of the notebooks!!! I seriously thought there was no chance of us finishing before the end of the week, and I’m still not completely sure about how it happened. The total notebook count is 266, and maybe about 50% of those are double wrapped (paper then plastic)… that means that we wrapped notebooks about 399 times over the last 5 days! That’s crazy. The wrapping process was down to a science today. All week, I’ve been tweaking things and working to make them more efficient. Today, we were on a roll. All of the notebooks were already sorted, the labels written, the papers and plastic pieces cut, so the only thing that anyone had to do was wrap! The less thinking required, the better. By the end, some of the kids were helping, Julie helped me finish up the last few, and I was refusing to stop until they were all done. Those things put together are what made the final stretch possible. Tonight is a night for celebration! So I’ll be going to bed… Oh to sleep 15 hours, uninterrupted. That would be the ultimate dream right now. The team’s last day is tomorrow, so we have an action-packed day in Lima ahead of us. As happy as I’ll be to not have to make 6AM coffee anymore, it will be sad not having them around. It’s been nice having some fresh faces around. Okay… I’m starting to type gibberish. That means it’s time to sleep. Chau! ​**This is from yesterday, but I literally fell asleep writing it. THE ROBOT WORKS!!! This is BEYOND exciting news!! To sum it up really quickly, Tony got the idea that Debbie and I should teach a robotics class, and we gave in slightly and agreed to do one robot project in our class. We found an instructable online that doesn’t require any programming (because that makes things WAY more complicated) and decided that was going to be our project. We brought the motors, wires, switches, and battery holders from the States, figuring that the rest of the parts would be easy to find in Peru. That was a bit of a mistake… We have managed to find the essential parts and pieces, but it certainly hasn’t been easy. We eventually tracked down a soldering iron, flux, and solder, but then we found out that the solder was too thick. Debbie bought some thinner solder this morning, and that has made all the difference. We also bought sheet metal here, which they didn’t have at the two big hardware stores we shop at, so instead we were directed all over Chilca to this construction supply warehouse where we bought a piece of sheet metal that is at least 20 times bigger than what we need. Anyway, everything finally came together today, and we finished assembling our robot! We were having soldering issues which were quickly resolved after buying thinner solder. Now it works!! And thank goodness for that because I wouldn’t know what to do to troubleshoot if it hadn’t. The basic description of the robot is that it goes straight, and when it runs into something, it turns itself and keeps going. AND OURS ACTUALLY DOES THAT!! (You can watch a video of it on my Instagram @larakaiserian… If you’re on a computer, there’s a link on the right sidebar. The internet is too slow to directly upload it here.) Debbie and I are ecstatic, even though we still have some logistics to figure out, because we didn’t have a backup plan. No problem though because it worked!! The rest of the day was pretty cool too. This morning, the team went into Chilca, got split up into groups of two or three, and had a shopping list of items that they needed to find. 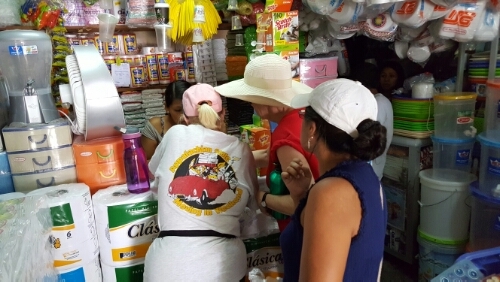 All of the Spanish speakers (myself included actually) were assigned to groups and told not to intervene unless someone was in desperate need of assistance. It’s a valuable exercise because it helps to give the group an idea of what it’s like to be in a situation where you’re completely out of your element and trying to figure things out without speaking the language. It definitely required some creativity (and charades skills) and confidence to go up to people and sound like an idiot while trying to find your things. If anything, the whole exercise made me realize that I know a lot more Spanish than I thought. I would have easily been able to ask shopkeepers about the things on our list. The groups all did well, and I was impressed with how willing they were to just go for it. The afternoon was filled with more vinifan-ing notebooks. I’m getting good at it and have my pace down to a science. In about four hours this afternoon, I wrapped 15 notebooks that needed paper and plastic coverings and 10 that only needed plastic. That means, I did 40 wraps in 4 hours, 10 wraps each hour, or 1 wrap every 6 minutes. I had previously estimated my pace at 5 minutes per wrap, and I think that might still be correct because I probably spent about 10 minutes per hour doing other things like helping people, organizing notebooks, cutting paper and plastic in bulk for everyone to use, etc. Exciting because I now know my exact pace… discouraging because at that rate, it would take me close to one eternity to finish all of the notebooks… hopeful because the team is still here, and anything they get done is less for me to do. In conclusion, sometimes it might be better to know less. ​Today was so much fun!!! We went on a field trip with the team and ALL of the kids. The morning was the usual: make coffee at 6AM (my least favorite thing to do), run back to my room and pray/read my Bible for about half an hour before I have to get ready and run to the kitchen again to make breakfast for the team (I’m a professional bulk scrambled eggs maker now), eat, and go to worship with the team and the other missionary staff. After that, the day’s adventure started! We loaded the 50 kids plus the 20 or so teachers, team members, helpers, etc. onto a coach bus, along with games and toys and food and water, and made our way to the beach. That wasn’t the ultimate destination, but we pulled off the highway for a quick pit stop. I thought it was pretty brave of the teachers to plan a “quick stop” at the beach with all of those kids. The beaches are all so pretty! Somehow, we got everyone off the bus and down to the ocean where they splashed around for about half an hour before we rounded everyone up again and went back to the bus. Also, when I say “we”, realistically, I played a very small part in making everything happen. My biggest beach duty was making sure no kids drowned, a task made much easier by the fact that none of them went in past their knees. The main stop of the day was a pool at this hotel/resort type place in Mirasur. 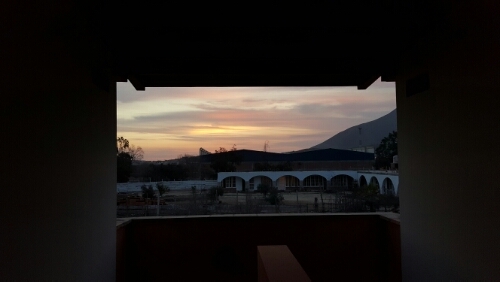 It’s about half an hour south of where we live in Chilca. Once again, my job was to come out of lifeguard retirement and make sure all of the kids stayed safe. I was nervous at the beginning, especially because that’s when kids are a little more rowdy. I had to grab a couple of kids throughout the day and pull them up, but they might have been okay without me. I just wasn’t willing to take any chances, so if anyone looked like they were even struggling, I didn’t give them a chance to keep going on their own. Once things settled down, I had a lot of fun! I swam around with a few kids, helped them with their swimming, attempted to teach Eddy’s daughter how to swim (and speak English… we’re determined to make her grow up bilingual), and got a chance to hang out and spend time with the kids while finally feeling like I was in my element. Time flew by, and before I knew it, it was time for lunch. We kicked the kids out of the pool, changed, and ate. We had about an hour and a half to go before we needed to head back to Esperanza de Ana, so everyone played in the hotel’s big grass field with frisbees, volleyballs, pool noodles, soccer balls, and some inflatables. I mostly spent my time having a frisbee catch with one of the kids, and by the time we had to leave, I was totally exhausted. The bummer of the day was that our soldering practice went horribly. We’re trying to get ready for our robot project with the kids, and we’re struggling. One of the guys on the team knows some things about soldering, so we asked for his help. He said that he thinks we have the wrong type of solder because it wasn’t melting as easily as it should. Part of me is feeling like, “Hooray! Maybe we’re not the problem!” and the other part of me is grumbling about the fact that they didn’t give us the right stuff at the store. It’s fine though! Everything will get figured out. For now, I need to go to sleep before I fall asleep at my computer again… anddd too late… I just did. Okay! But I’m up again and will go to bed as soon as I get this posted.